I have had this top in my wardrobe for ages. It's one of those items that you don't want to throw away, but every time you put it on you take it off again as it's not quite right. This top is made from fine jersey fabric that clings annoyingly around the hips and tummy (see first pic) and the length was a bit in-between as well. Time to do something about it. Enter my cheat's shirring method - of course if, unlike me, you are able to get your machine to shirr/smock in the usual way go right ahead. I applied several rows of shirring elastic in a continuous spiral around the bottom of the t-shirt, starting 1-2cm from the hem. 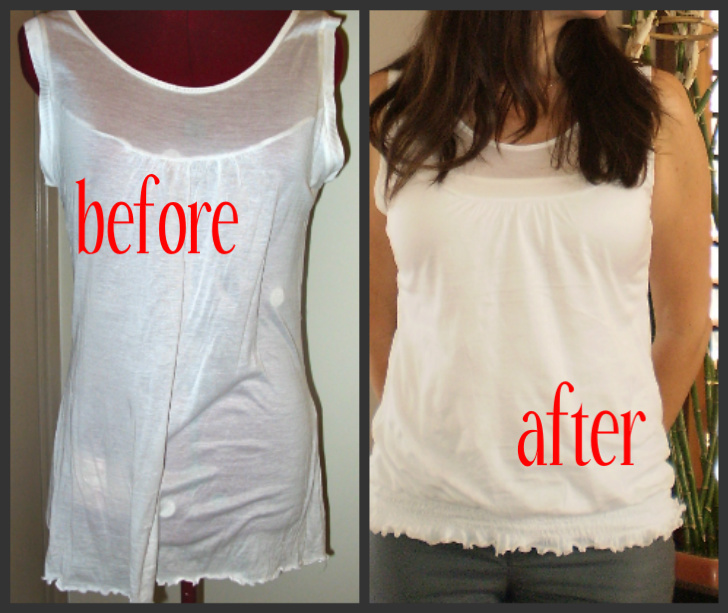 This t-shirt had a serged, rolled, lettuce hem so the effect was quite pretty after the shirring. 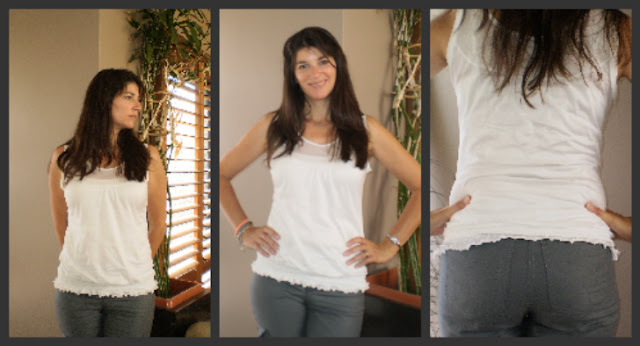 If you have the length in your top, you could replace a normal t-shirt hem with your own rolled lettuce hem using a serger or a small, close zig-zag stitch, stretching the fabric as you sew, or just leave the original hem. Once you have done enough rows of shirring, just merge the elastic into the row below to finish it off. You will never notice that you haven't got individual rows of shirring once it is being worn. This is now finished, although I decided that my top was still a bit long, so I just sewed a pleat of fabric to the inside of the t-shirt, just above the shirring and trimmed off the excess. Here it is - with a sneak peek at my new Jalie jeans!!! I'm wearing a cami underneath in these pics.